Many things have sideways value. Poetry for example. Its mnemonic features give us poems to remember things, like the number of days in a month. And words have their own music, so much so that even verse in a language we don’t know can sound beautiful in an abstract way. Politics too and public events, for all we toil in or tire of it, has sideways virtues. I’m not much of a philosopher, but a poet like Wallace Stevens still pulls me into philosophic thoughts with his word music and his choral structures. And it seems to me that our current political world, even without intent, is calling us to think about belief. Not just what we believe (a question we sometimes do not pause to ask), but what are the consequences of our beliefs for ourselves and others. Since the Parlando Project is about poetry meeting up with music, I’m not going to attempt a grand 500 word summary that lays out a philosophic framework for answering such questions today—I’m probably not capable of it—but I am going to offer a new Dave Moore song that makes a useful list to remember, has some nice music to it, and could lead you to ask a few questions. Dave’s song is called “Five Kinds of Truth.” In my introduction of it today I’ll ask you to consider what the lyrics speak of as “truth” instead as “belief.” Philosophically, or in any strict sense, those two terms: belief and truth aren’t the same thing. But informally and humanly we equate and relate these two things all the time. After loyally refusing to read the prequels written by others for Alan Moore’s Watchmen series for years, I finally broke down when they showed up at the library. Copyright loyalty aside, they were really very good. 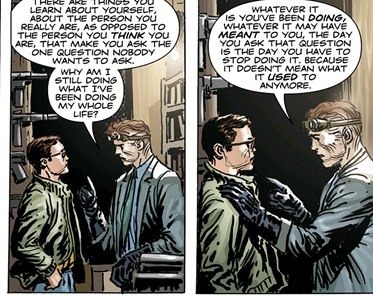 J. Michael Strazinski did a particularly great job with the Nite Owl character, and during one of the soliloquies in search for identity was the concept of 5 Kinds of Truth. Which I lifted and rephrased because it was too good not to. So, what did Dave do with this, and what did the LYL Band do to accompany it? Use the player below to find out.